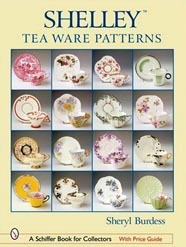 This book presents thousands of tea ware patterns produced by Shelley Pottery and its predecessors, from the 1860s through to 1966. Arranged by pattern number, thorough listings include the colour variations, backstamps and the numerous body shapes on which the patterns appear. Over 760 beautiful colour photographs display Shelley porcelain tea wares. Over 100 line drawings illustrate the body shapes. A bibliography, index and current market value complete this valuable, 248 page, guide.